On the auspicious occasion of Sri Krsna Janmastami 2018, Gosai Publishers are happy to announce the second printing of “Bhagavad-Gita – Sri Krsna’s Illuminations on the Perfection of Yoga’ with commentary by Swami B.G. Narasingha. The Bhagavad-gita is the key philosophical scripture that delineates the esoteric principles of bhakti-yoga. Within this conversation between Bhagavan Sri Krsna and His devotee Arjuna, lies the answers to the most fundamental questions of life and a clear explanation of the devotional process which can uplift practitioners to the platform of pure consciousness. The Anuvrtti commentary of Srila B.G. Narasingha Maharaja provides readers with a lucid explanation of this classical ancient Sanskrit text. 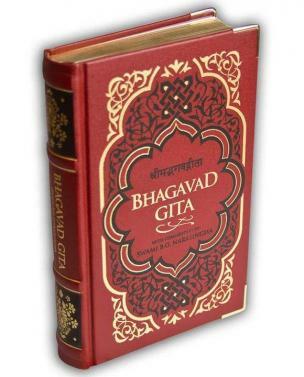 Simple, yet profound, this unique edition of the Bhagavad-gita is a must for practitioners and seekers alike. 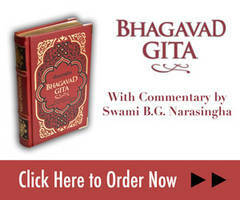 This book is available at our Srimad Bhagavad Gita website, at Devavision online store, and at Amazon.com.